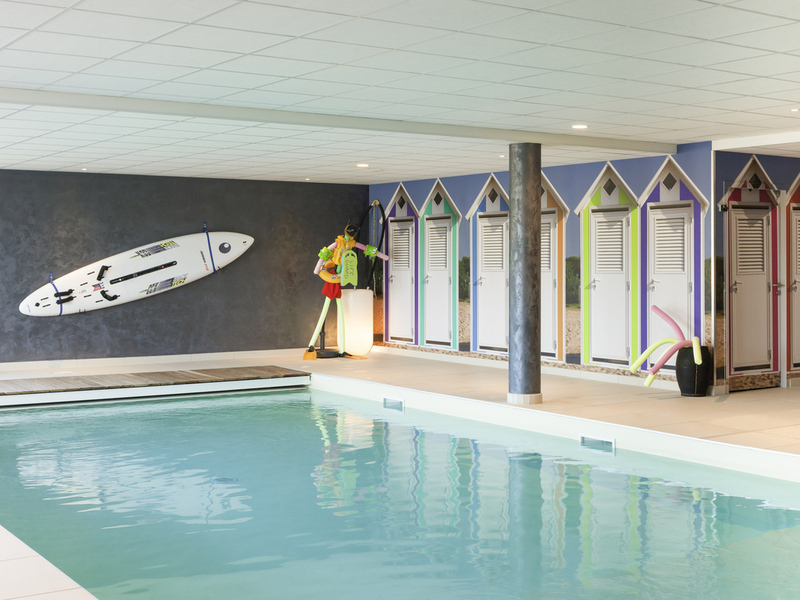 Breakfast, indoor heated swimming pool, fitness area and WiFi included in all prices. The hotel has 56 rooms including 13 family suites and 5 suites. Close to the highway and 5 min. from the city center, the hotel has a contemporary "Recoup" design called Second Life, Av EC objects repurposed. Ideal place for your leisure or business stays. On-site dining at the bar or in the room. Located in the heart of the Sologne region, 5 minutes from Vierzon city center. Discover the Châteaux of the Loire Valley. Visit Beauval Zoo. 30 minutes from Bourges. 1.5 hours' drive from Paris. At the intersection of the A20, A85 and A71 highways. Buffet breakfast and unlimited WIFI included in all prices. Bar and snacks in the hotel. Family Room available on request. 5 min from the city center. beIN Sports available in the bar and rooms. So that you can relax at any time during the day, the "Le Comptoir" bar is open from 11am to 11pm. Why not come and sample local wines, enjoy a beer or a refreshing drink. WIFI access and catering available. Friendly helpful staff. Good to be able to make tea in the reception area as very thirsty after a long journey. Restaurant next door was closed so had to eat in snack bar which was very limited in choice. Breakfast was good, plenty of healthy options. A nice, smart great value hotel for a travel stop-over. Check in process was easy, helpful staff and we had a twin room which was nice and clean with comfortable beds, a roomy shower. The hotel has a nice ambiance and has that little quirkiness that an Ibis Styles hotel brings. The bonus is the hotel has a nice little swimming pool which was excellent to unwind in after a long drive. The one slightly negative thing was that the Courtepaille restaurant next door was closed meaning that you were forced to go further afield via a car to find somewhere to eat. The reception provided some suggestions and in the end we decided to have one of the Pizza bar snacks that was available at the hotel. Breakfast was the normal continental style with a choice of cereal, breads, cheese, fruits and a nice freshly squeeze orange juicer. This is the second time that we have used the hotel and we will do again in the future when we travel the same route through France. Very originally styled hotel, great welcome by staff and nice bar area. The rooms are good, but for save the dress needs some wardrove. Breakfast is so good. Stay was great but the night was hot and we both couldn't sleep that well. Plastic sheet under sheet didn't help! Rooms are very comfortable, staff very pleasant. Overall a very good quality stay. This hotel is excellently located for a stop off going north or south so we will definitely be back, it was clean, comfortable and having a pool was perfect. The staff were very nice and welcoming. I would have liked to have a tea in the morning in the room but overall a nice stay. Everything was as good as we remembered it from our stay 3 years ago. Why has it taken us so long to return. The welcome was brilliant, the room including the en suite shower room had everything we needed and was spotlessly clean, the breakfast- just super and all ready for us to eat at 6.25 am on New Year’s Day. Added to all that, a swimming pool to use when we arrived. A super way to end 2018 and move into 2019. Thank you to all the staff. We really appreciated your efforts and will return as soon as we can. Reception was quick and efficient, the room was comfortable with an excellent breakfast. I booked one night at the Ibis Styles Vierzon for our family. It was fabulous! Very welcoming staff, young and motivated, quiet room, tea, coffee and mulled wine for free in the lobby. Play corner for kids in the lobby. There is no restaurant in the hotel, though one could get some simple dishes at the bar. There is a steakhouse right beside (50m) the Ibis (courtepaille), very family friendly, too: Santa came during - surprise!! excellent and rich breakfast, fresh orange juice (! ), eggs, fruits, bread, pastry.... We went to the pool after breakfast, it was clean & warm, pool towels available for free. I highly recommend the Ibis style vierzon! Good bed, good breakfast, good price and startlingly original industrial chic decor. Well worth a visit. Only stayed for one evening, on our way from UK to Spain. We've stayed here on many an occasion, always having a positive experience. The decor is great, and the rooms very spacious.